Hamster Lost in Food is a wonderful matching game with puzzles. 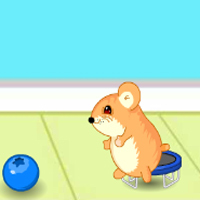 In this game you make way for Hamster so that he can reach to his home. The shortest path between hamster and its home is highlighted by yellow blocks. Early the Hamster reaches to his house, more score point you will get. Tap a group of similar blocks to get them removed. Try to remove those blocks which make hamster walk towards its house. This is an Ad Free Game.